If you’ve ever walked into a restaurant with fairly loud music and/or background noise, it probably affected not just your mood but also your choice of food. 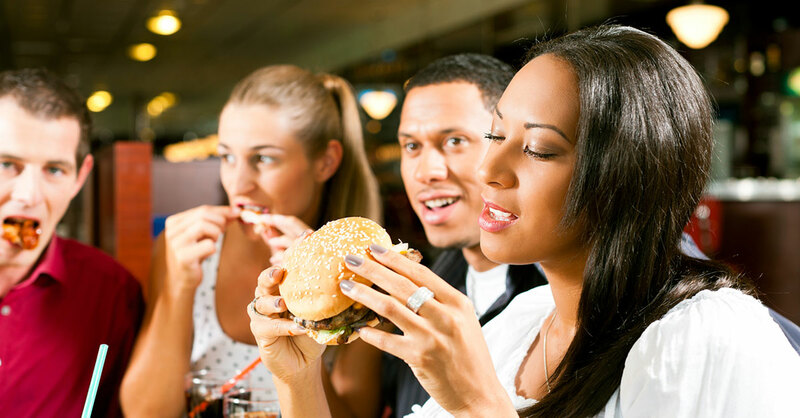 A recent study by the Association for Consumer Research found that the music restaurants play can steer their customers’ choices, and that could make you eat food that’s bad for you. Results: When the music was played softly, nearly 43% of patrons ordered items classified as healthy. When researchers cranked up the volume, however, only 32.5% of patrons—about one in three—ordered healthy food. Next, researchers applied those results to the controlled environment of a laboratory, where their hypothesis was confirmed. When asked to choose between a fruit salad and chocolate cake, lab subjects chose the fruit 86.4% of the time in a setting with quiet music but went for the healthier choice just 56.5% of the time in the louder environment. Your ears help your brain decide what to eat. The science behind the research involves some complex neurological factors but, essentially, what happens is that, like all sensory input, sound can both overtly and subliminally influence our behavior. Loud music arouses you—you know that—and that arousal is actually a form of stress. It might be a kind of stress that you like, but as with any stress, it can subliminally nudge you toward a preference for high-energy, high-fat foods. This could be because fatty (and sweet) foods naturally reduce stress and excitement levels. So, what does this mean for you? First, it helps you understand why you’ll walk into a restaurant planning to order a salad and end up with a bacon cheeseburger and fries—it’s the noise in the place that muddled your brain. This can prepare you psychologically for the greasy, gravy-smothered suggestions your ears will send to your brain in loud restaurants…or even make you stop and choose a quieter place to eat.